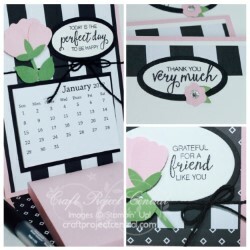 Just Julie B's Stampin' Space: Blossom Builder Calendar & Note Card Gift Set! If you’re immersed in the holiday season, but have a need for some quick and thoughtful ideas for gift-giving - this gift set is your answer! The recipient of this gift will be prepared for the New Year and days to come! 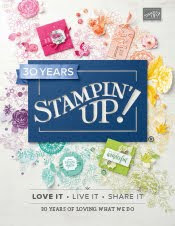 You’ll learn how to make the simple, but oh so pretty and practical Stand-Up Mini Calendar with Post-it Pad. And everyone needs some quick, but cute Note Cards with envelopes for quick a thank you every now and then! The Note Cards and Envelopes are easily gifted in a quick Cellophane Bag! And the Coordinating 3” x 3” Gift Card will top off this perfect gift for that person who is so hard to buy for! This pretty project was made by ME!! And you can get the tutorial when you subscribe to the month of December over at Craft Project Central.